"The People’s Kitchen utilises and spreads awareness of food waste and celebrates the power of community by bringing together a team of volunteers to transform food that was heading for landfill into beautiful cooked meals that are served up on a ‘pay what you want’ basis. The food supply system is in a precarious situation, prices are rising, and in some areas food shortages are already a common theme. One billion of the world’s people are hungry and as the world’s population rises, the problems look like they will be getting worse. Yet we throw away tonnes of food every year. Estimates put the level of food waste in the UK at 20 million tonnes from plough to plate. All food has taken energy, time and resources to create. 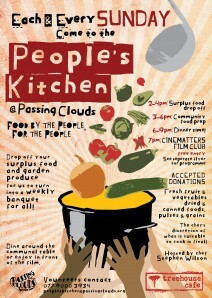 The People’s Kitchen aims to intersect this food surplus before it finds a sad end within our UK landfill sites which are presently full to bursting point. The kitchen also celebrates People power. Many hands make light work, and many bodies and minds make for a beautifully social atmosphere both in the kitchen and later, the dining room. So come and get involved or even start your own People’s Kitchen. The People’s Kitchen is as example to us all that many of the things that we want and need in life are already there around us, and don’t have to cost the world."